Opening a brand new restaurant can be confusing and stressful. With so many different things to keep track of, it can be easy to forget kitchen equipment and appliances that are essential to operating your business. To help you stay on top of your to-do list and ensure that your restaurant opening goes smoothly, we created this list of the top 10 pieces of restaurant equipment that every establishment needs. Refrigeration equipment is critical in a foodservice establishment because it prevents your food from spoiling or melting. While refrigerators and freezers are essential, different types of restaurants will need various features and capacities. Fortunately, there are many types of refrigerators to choose from, so you can find the perfect one for your establishment, whether you’re opening a sandwich shop, fancy Italian restaurant, or a fast-casual joint. Whether you’re creating delicious Cuban sandwiches in a panini press, flipping pancakes on a griddle, or adding appetizing grill marks to your steaks, commercial grills are an essential part of your kitchen. Grills come in all sorts of shapes, sizes, and types, making it easy to find an option that will perfectly meet the needs of your business. When it comes to serving beverages, ice machines are just as crucial as soda fountains. Ice machines create ice and then dispense it into an ice bin or soda fountain. While ice is necessary for serving soda and iced water, you can also use ice machines to create blended drinks like smoothies, margaritas, and alcoholic slushies. Salamander broilers are valuable pieces of equipment for pizzerias, sandwich shops, and bakeries as they allow you to finish off your dishes before serving them to your customers. Salamanders brown the top of your dishes and melt cheese on top of your casseroles and sandwiches to entice your customers. Some of these products also attach to your range or directly to your walls, so they don’t take up valuable countertop space. Griddles are ideal pieces of equipment for cooking many different foods, such as burgers, breakfast foods, and grilled sandwiches. Due to their versatility, griddles are an essential appliance for any foodservice establishment. Plus, there are several types of countertop griddles, which are ideal for small restaurants or food trucks. Grease, sediment, and solids entering your plumbing system can lead to lengthy and expensive repairs, so it’s good to protect your plumbing by using a grease trap. Grease traps attach to your commercial dishwashers, prep sinks, and other equipment that connects to your plumbing, and they catch any grease or food particles to prevent them from draining into your pipes. Because they can save your business a lot of money in repair costs, they’re essential items for any foodservice establishment. A sharp set of chef knives is indispensable to chefs in any foodservice setting. Chef knives come in many different sizes and styles, allowing chefs to choose the option that best suits their task. Most chef knives also feature ergonomic and comfortable handles, which is ideal when preparing large quantities of food and chopping for long periods of time. Shelving helps foodservice establishments stay organized, and it can be used to store and organize anything from food items to dinnerware. Many types of shelves are heavy duty and are made out of durable materials, allowing them to hold lots of products without buckling. Additionally, some racks are rust-resistant and feature epoxy coatings that make them perfect for use in humid environments, like walk-in refrigerators and freezers. Whether you’re looking for a condiment dispenser to leave on your tables for self-service or you want a product to improve your plating technique, squeeze bottles are perfect. You can use these products to hold many different types of liquids, like condiments, sauces, oils, or salad dressings. Most squeeze bottles also have easily removable caps, which make them easy to refill. A kitchen printer, typically called an impact printer or dot matrix printer, is used to print tickets from your restaurant point of sale system to your kitchen so your kitchen staff can prepare the food for your guests. Some kitchens may just need one printer, while others may require multiple printers. For instance, you may need a dedicated printer for your prep station or expeditor, while having a dedicated printer for your line cooks. Modern POS systems like Harbortouch allow you to specify to which printer you want your menu items sent for preparation. 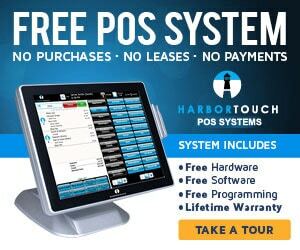 Harbortouch is a premier provider of restaurant POS systems, visit https://www.harbortouchpossoftware.com to learn more about our various products and services or visit our Google+ page Harbortouch POS Systems.